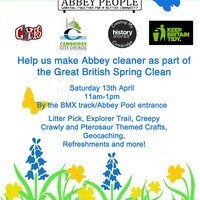 Home » News » Abbey Environment Day - Sat 13th April 11am to 1pm - All Welcome! Abbey Environment Day - Sat 13th April 11am to 1pm - All Welcome! Abbey Environment Day is here again! Please join us on Coldham's Common by the BMX track. Refreshments and Activities with Abbey People and Historyworks FREE for all Participants! 11am to 1pm Historyworks will be providing Arts activities for exploring the area - with geocaches trails, bug and pterosaur toy making, mini-bug hotel activities, and mapping your favourite places along the Chisholm Trail. 11am set off for litterpick for those up for a stroll around Coldham's Common - with the usual crew - plus others will be welcome - gloves and bags and pick-ups will be provided - usually takes 30 mins to do a circuit and then all those involved join in the Arts activities afterwards. Refreshments and Arts activities are all free.